Today on the Alex Jones Show, Alex asked listeners to search both ‘save his presidency’ and ‘Obama terror attack’ in an effort to get the word out about a powerful article by Paul Joseph Watson outlining President Obama’s claim that America can “absorb” a terror attack. 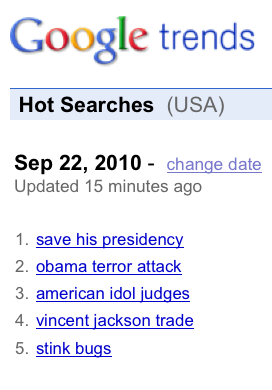 The response was so great that Google Trends listed the term as its top search term during the afternoon of September 22, 2010. Also, the secondary term given ‘Obama terror attack’ has reached the second position further confirming the importance of this critical article. This listing is watched by news sites, talk shows and bloggers all over the world and used as a benchmark for determining stories and articles that are of great concern to web users. It is also a clear demonstration of the size and dedication of a growing movement of citizens concerned about the agenda of the global elite. With this kind of continued effort, the truth can reach a much larger audience and wake more people up to the lies and misinformation spread by much of the mainstream media. Note from Alex Jones: Great job Infowarriors! This is a big achievement in the ongoing effort to spread the word about these important issues.